Hey all. I just joined because I saw someone's rig here running a setup that I've got questions about as well as to get ideas from all the other threads. My wife and I each owned a Tundra back in 2005/2006 and we sold them when the gas crunch hit. Well, FF to 2017 and we moved from NH to TX to get out of the snow. We moved to the Austin area and have since bought 27 acres to begin building out retirement home on. I was in a 2015 4Runner at the time. After getting the land, we bought a tractor with a loader and backhoe to start work out there. 4Runner isn't hauling it so bye-bye and hello new 2017 Tundra. Hope to catch up with that other member and discuss his setup! 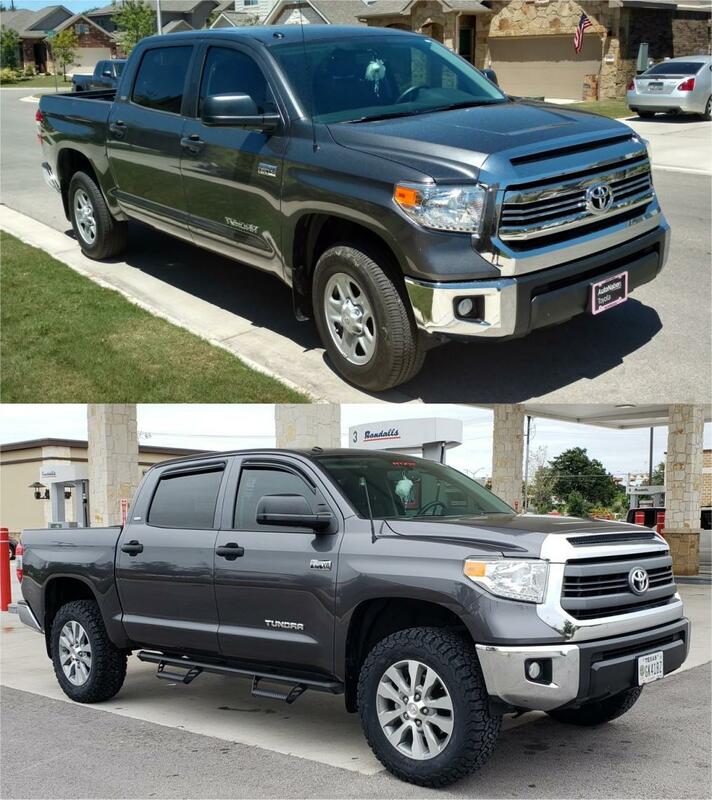 Here is how it looks the day it came home and how it looks now with a 3/2 level kit, OEM Platinum alloys with BFG KO2 285/65R/20s, steps, Firestone airbags and a 2015 grill insert to cut some chrome off... ***EDIT*** Also a pop-lock for the tailgate from a group buy. Last edited by ejrtex; 02-26-2019 at 12:56 PM. Hi @ejrtex . Just noticed you're a new member. Welcome to TT. I love what you've done with the color. P.S. Probably not many scorpions in NH, but watch out here. New scorpion season is just about to begin. Don't go walking around in the dark barefoot and inspect guest rooms before occupancy. Scorpions have been known to fall off the ceiling into bedding or on top of guests. One fell on my visiting grandaughter...miraculously, she still comes back. These RCLB rigs are highly coveted by gardeners and landscapers all over my village ! Last edited by MetalMonkey; 02-26-2019 at 05:08 PM. Old-school longbed! Nice! We don't see many of those! Thanks for the welcome @MetalMonkey ! No scorpions where we are at all, not much of anything dangerous in this thick neighborhood except a couple neighbors! LOL! Now out at my property, we have some dangerous things. A few nasty spiders met their death while the good guys were left alone. I've seen three rattlers out there but two got away. Third one was very agressive and not smart enough to make a break for it so he got the machete treatment. Last August we rolled up on a huge King Snake. I named him Bubba and told him to stick around. We haven't seen a rattler since Bubba moved in. He's a keeper. Still, no sign of a scorpion out there but we are always on the lookout. I don't walk the property without my snake boots on anyway... at least until we get it cleared and groomed. As for the truck, I'm looking at putting an ARE CX HD shell on it with the internal frame so I can load up a roof-top tent. My wife and I want to go explore a lot more of Texas without the hotel bills. Big Bend is calling us back! We come out your way once every couple months to get out Blue Bonnet Cafe fix and take home a couple pies. Or, stop there for breakfast on the road to Fredericksburg for the weekend. Love the drive out there through hill country! Beautiful ride you picked up based on the pics. I’ve flown over Big Bend just haven’t made the road trip yet from down the road in San Antonio. Welcome for you neighbor a little further east in College Station! Great looking rig you have. And I agree, the hill country is beautiful and it is hard to beat a weekend in Fredericksburg.